This week students, staff and faculty celebrated the launch of the Take Charge project that has brought three dual-charging electric-vehicle (EV) stations to campus, more than doubling the number of charging stations in Waltham. The new ChargePoint Level 2 (240 V) dual EV charging stations are located in the admissions, athletics and Tower lots. Proposed last year by Vivian Zeng ’13 as part of the “Greening the Ivory Tower” class, the Take Charge project is funded by the Brandeis Sustainability Fund and federal Department of Energy grants. “The Take Charge project shows a real desire to move away from fossil-fuel reliance and carbon emissions, by promoting the use of hybrid and electric vehicles on campus,” says Zeng. 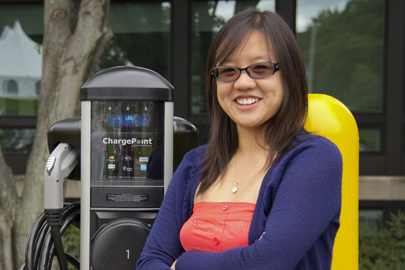 With the support of professor Laura Goldin, Zeng created the Take Charge project to bring EV charging stations to campus for the benefit of the entire Brandeis community. Zeng hopes the charging stations will encourage Brandeis to build an electric vehicle fleet and keep pace with schools like MIT and Yale that already have EV charging stations in place. “I encourage everyone to ‘take charge’ and be an active part of the sustainability evolution,” says Zeng. For more information, visit the campus sustainability initiative website.